The 2017 St. 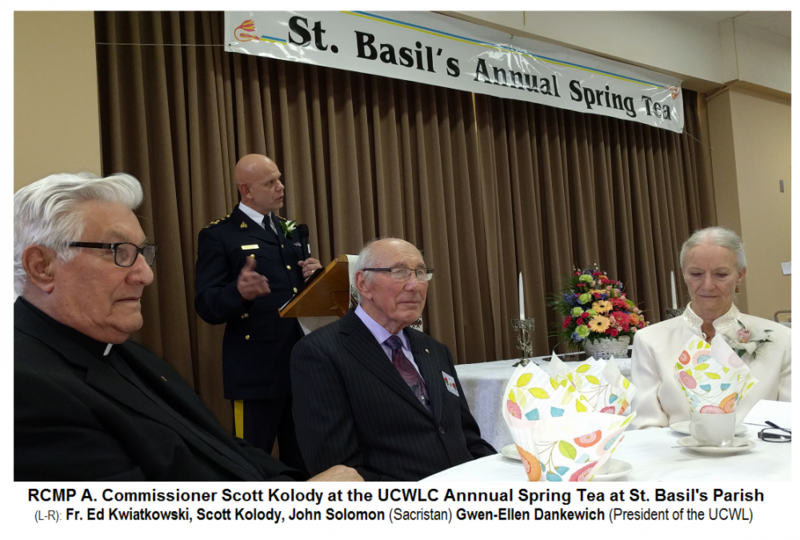 Basil Parish Spring Tea, which is organized and hosted annually by the parish branch of the Ukrainian Catholic Women’s League of Canada took place Palm Sunday afternoon, April 9th in the parish hall (202 Harcourt Street). 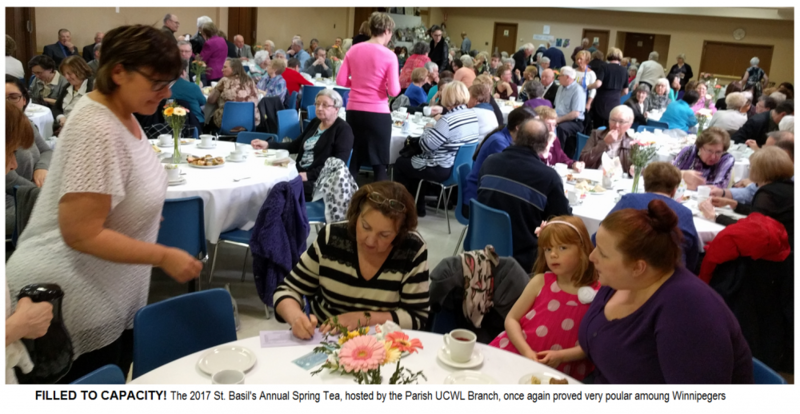 The members of the local branch prepare days in advance to make the tea one of Winnipeg’s premier spring social events. The tables were brightly decorated with spring colours and the food was all fresh and exquisitely served. The tea was delicious and, as expected, flowed generously throughout the afternoon. The guest of honour was one of Canada’s finest – Assistant Commissioner of the legendry Royal Canadian Mounted Police, Commanding Officer Scott Kolody. 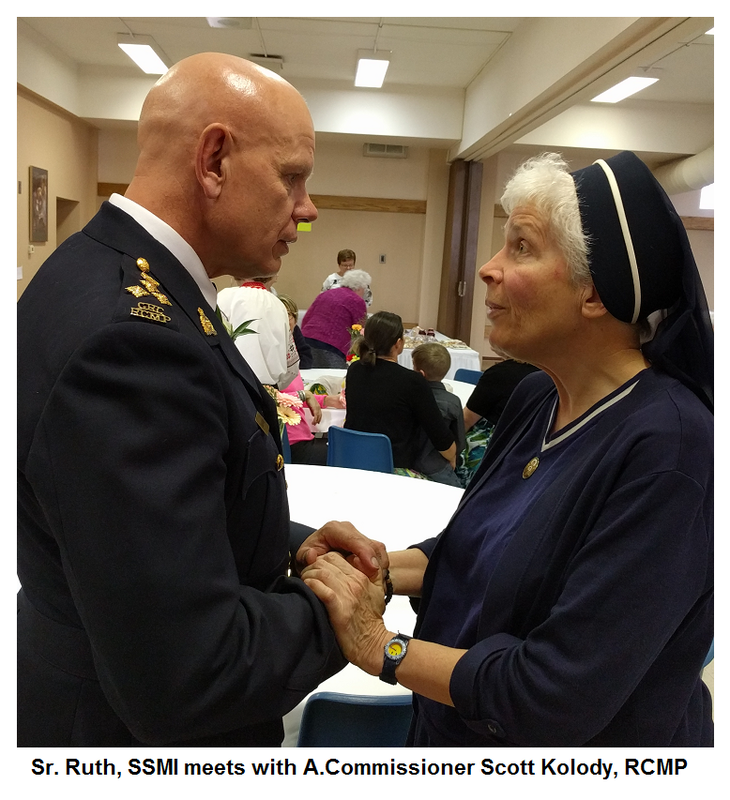 He engaged the guests with an unique presentation of the mission and work of the RCMP – especially around the province of Manitoba. Many came forward afterward to express their satisfaction that they were treated to a first-hand overview of the activity of the RCMP that few Manitobans may ever know. The commissioner even impressed the crowd by delivering the opening lines of his talk in Ukrainian! The afternoon began with a greeting and prayer offered by Parish Priest, Fr. Michael Kwiatkowski. The heartfelt welcome of the guests was expressed by UCWLC President Mrs. Gwen-Ellen Dankewich. Guest speaker Comm. S. Kolody was introduced by League Vice—President Linda Gardener. There were a number of special guests that showed up throughout the afternoon, including clergy, religious Sisters, police officers and many people from around the city…. And beyond. Everyone was surprised and thrilled when the Bishop of Saskatoon - Bishop Bryan Bayda walked in. 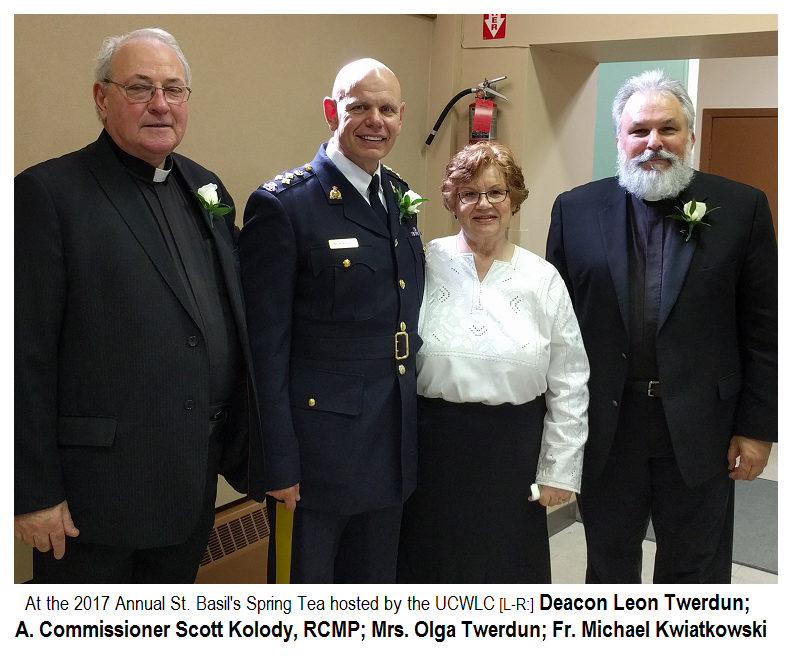 He was in town attending a funeral the next day and decided visit the famous St. Basil’s Spring Tea. The afternoon included a raffle of impressive prizes provided by generous donors. There was also a ‘silent auction’ of some 17 extraordinary combination prizes - elegantly displayed. There was a hugs bake sale of sweets, Ukrainian staples like “holubtsi”, jams, etc. St. Basil Parish will also host this year’s annual “Chrism Liturgy” with the Archbishop of Winnipeg, Metropolitan Lawrence Huculak on Holy Thursday morning, April 13 at 10:00 AM. Many of the clergy and faithful of the Archeparchy gather for this special Holy Week liturgy that includes a re-enactment of Christ’s washing of His Apostles’ feet at the Last Supper. All are invited.